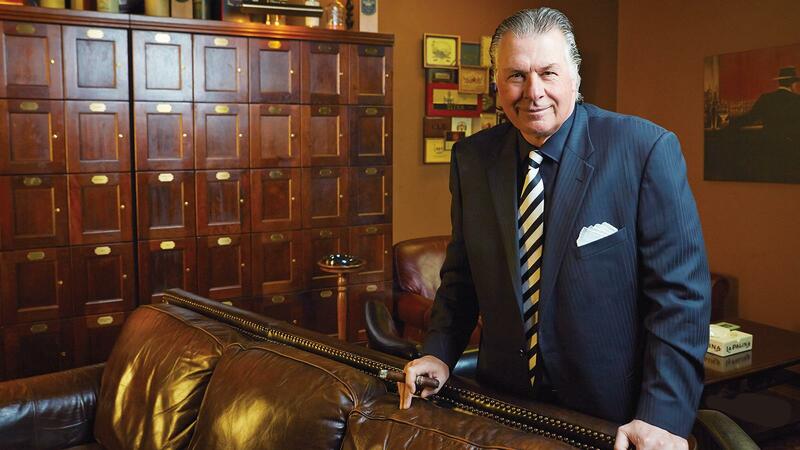 ESPN hockey analyst Barry Melrose, shown here at Mickey Blake's Cigars in Southington, CT, played 8 seasons in the NHL. For the past 20 years he’s been a dedicated cigar smoker. Barry Melrose is sitting on a plush couch in Hidden Havana, a dim but homey cigar club in Southington, just a holler from the ESPN campus in Bristol, Connecticut. "I get paid to talk about hockey," says ESPN's hockey analyst, cigar in hand. "If I wasn't paid, I would be watching anyway." His hair—a black and silvery mane—is combed back. His size is imposing, befitting one who played defense in the National Hockey League for eight seasons. The face is smiling, honest and ruddy, as if still wind-burned by the frigid climate of Kelvington, Saskatchewan, where he was born and raised. Melrose holds forth on a range of hockey topics, such as how important last year's Final—with contestants from the biggest media markets, New York and Los Angeles—was for the NHL. Before a question of what team has the best jersey is even finished, Melrose fires: "Chicago Blackhawks, red jersey. It's the best jersey in all of sports." Look at it and you might just agree. Hearing Melrose talk hockey is akin to hearing a political analyst at a fireside chat—minus the caution. Pols check themselves, endlessly self-editing to abide the omnipresent strictures of political correctness. Not Melrose. His passion pours forth in short bursts—in affirmative, forceful sentences, absent any pretense. In the foreword to Melrose's book Dropping the Gloves, Wayne Gretzky writes, "No one talks about the game of hockey better than Barry." Melrose takes a puff of the cigar. "What I would love is at the end of ‘SportsCenter,' the husband is sitting there watching, the wife is there, he turns to her and says, ‘You know, I'd love to have a beer and cigar and talk sports with Barry Melrose.' I think that would be the ultimate compliment. I don't want to be one of these analysts who gives you paralysis by analysis. I want to entertain. I want people to love hockey. I want them to see the entertainment value of hockey. I want them to see how great our athletes are." At the moment it's a cigar, sans beer. Barry savors a La Flor Dominicana. He draws on the full-bodied smoke and holds it in a bit longer than most before letting it out. He looks around at the clubhouse, proud of what he and his pals have done to a once-barren warehouse. Posters of florid cigar labels adorn the walls. This lounge for some 30 members includes a card table, TVs, a refrigerator and a glass cabinet that shields their finest smokes. "I've always been one of those who can't figure out why people don't like cigar smoke or pipe smoke," he says. "My grandfather smoked a pipe; I can still remember the smell. "I've been smoking about 20 years. I like a strong cigar, so if you go into my cabinet you see La Flor Dominicanas and others. My favorite is the OpusX made by Fuente—great cigar, hard to find. There is a place in Florida I go to, and when I go there I always get one. The one thing that is nice about Florida is that they will still let you smoke outside and still let you smoke in bars and some restaurants." For Melrose, there is one additional spot unavailable to the rest of the smoking universe: the ESPN campus. "There is a football field—have you seen the Yankee seats they bought from the old stadium? At night, I sit there between shows and have a cigar when no one else is around. And if I have an hour or so between shows, I'll jump on the walking path and have a smoke. People will walk by me and say, ‘Barry that cigar smells so good.' " Who knew that ESPN is cigar friendly? Not exactly. "They're letting Barry Melrose smoke," he laughs. Melrose and his broadcast partner Steve Levy have been covering hockey at ESPN for 21 years. They were also once co-owners of a United Hockey League team called the Adirondack Frostbite. After an 11-year pro career and several coaching stints, Barry sought the Los Angeles Kings' job, "just so I could coach Wayne Gretzky." He wasn't disappointed. Melrose has found his true home as a hockey analyst. He breaks down "SportsCenter" highlights and ranks the league's best fighters. He and Levy even wear and discuss flashy team shirts, which fans send in. Melrose is a veritable clothes horse in his own right, partial to distinctive, colorful and memorable ensembles and never seen wearing the same suit twice. Before the hockey grind and NHL arenas, before a trip to the NHL Stanley Cup Finals and the studio lights of the world's largest sports network, there was farm life in Canada. Barry Melrose was born in Western Canada, in the farming town of Kelvington, Saskatchewan, on July 15, 1956. The agrarian locale gives new meaning to the word "rural." A cheery sign beckons: "Welcome to Kelvington. Grow with us." "If you watched Andy Griffith, you know Kelvington is very similar," Melrose says. "Everybody knows everybody. Everybody is watching everybody else's kids. It's a great place to grow up." Everything Melrose would become was rooted in that farming life. "Most of us were farm kids growing up there," he says plainly. "You rise early and work; nothing is given to you." He spent more hours than he could count playing hockey. "Number one, I grew up loving the sport. I grew up in a town which had a rink. Every small town did. Which means I was on the ice as long as I wanted to be, all day long. On the weekends I had my skates on at eight in the morning and I took them off at midnight. My father and my grandfather also helped me with sports; they coached baseball and coached hockey and drove me everywhere." So something was given to him. A lot of the time hockey came first—before baling hay and milking cows. "I can remember being five or six years old and watching the Stanley Cup Finals. I was a Toronto Maple Leafs fan. I remember praying to God, asking, "If you let the Leafs win, I will commit my life to you." Divine causation aside, the Leafs did win cups when he was five, six and seven years old. They won again when he was 10, in 1967. The bad news for Melrose is that they haven't won since. Though he played baseball and football, Melrose's youth was nothing if not an interminable rendezvous with hockey. "In Kelvington High there was a guidance teacher named Mr. Harrison. He took the boys aside and said, ‘I want you to write what you are going to be when you grow up.' So everyone is putting I'm going to be a doctor, I'm going to be a teacher, a farmer, a member of the RCMP [Royal Canadian Mounted Police], stuff like that. So I wrote ‘I am going to play junior hockey and then play in the NHL.' He called me over and said, ‘This is really nice, Barry, but you should be preparing seriously for what you are going to do.' I said, ‘I am going to play junior hockey (which I did when I was 15) and I am going to the NHL.' " He not only achieved the former, but the latter as well, playing for the Winnipeg Jets at age 23. "Of all those boys," he says, "my paper was the most correct." Most athletes can recall the time they knew they could make it. For Melrose it happened in juniors. "I was 17 playing against 20-year-olds. I made the All-Star team as a defenseman, and I started to realize I'm pretty good." Junior hockey in Canada is comparable in skill to college hockey in the United States, only junior hockey is a business. "Every town of any size in Canada has a junior hockey club. It works very well: NHL players still come out of junior hockey in Canada. But you have to make money in order to keep the team." Actually, few players emerge from the juniors to splash down in the NHL. "They've done studies: just one out of 100 get to play in the NHL," Melrose explains. "Even a smaller percentage get to play any real time in the NHL. A lot of guys have a cup of coffee—but few get to stay for the meal." Your chance of enjoying the meal improves if you make the right choices, like playing the right position. At a playing size of 6' 2" and 230 pounds, Melrose knew his meal ticket was defense. "I was always a big kid; as a defenseman you play more. I remember games in juniors where I played the whole game and never left the ice. You can do that as a defenseman, not as a forward. Also, defensemen were always my favorite players: Bobby Orr, Tim Horton, Brad Park. I was big and strong and physical." Anyone who lasts 11 years in a major sports league has, at the very least, found a niche. Greek philosopher Socrates said, "Know thyself," proclaiming it the most important kind of knowledge. Melrose had that wisdom and found a niche as a bruiser. "In juniors I was a more offensive defenseman. But I realized that I wasn't going to play pro as an offensive defenseman. I was going to play pro as a good puck-moving defenseman. I had to hit everything that moved and be tough to play against. "I wasn't going to be a finesse player and play any time in the NHL," he says. "I realized that I've got to be a guy that hits and fights and scratches and claws and is tough to play against." His 11 years as a pro included three with the Cincinnati Stingers of the World Hockey Association (1977-1979), followed by eight more seasons with Winnipeg, Toronto and Detroit of the NHL (1979-1986). All told, he played in 300 NHL regular season games and in seven more playoff games. His best day as a pro? "It had to be the day I met my wife," he says of the day in 1978 when he said hello to Cindy, one of the cheerleaders on the team. They were married that same year, after knowing one another eight months, and have been married for 36 years, with two grown sons, Tyrell and Adrien. Following successive coaching gigs with outfits such as the Medicine Hat Tigers and Seattle Thunderbirds of the Western Hockey League and the Adirondack Red Wings of the American Hockey League, Melrose got a chance to return to the NHL bench. "I was making $50,000 in the AHL. Los Angeles was going to fax me this offer," he says. The problem? The only fax machine was in the main office. He needed help, and sent his secretary on a mission to keep the fax quiet. "She called and said, ‘Your offer is here. I'll bring it down.' She put it on my desk and said, ‘See ya.' " He signed a four-year deal for $250,000 a year. "The main reason I went to Los Angeles was to coach Gretzky," Melrose says. It was the 1992-1993 season. In the 25 years before he got there, the Kings hadn't made a mark, though in 1969 they won 24 and lost 42 and made it to the semifinals. Truth be told, the team posted four consecutive winning campaigns before Melrose arrived, the best in 1990-1991, when they boasted a record of 46-24-10 before losing the Division Finals to Edmonton. But the 1992-1993 campaign had a bit of magic. "It was just one of those years," he recalls. "I had a great team. It was really an unbelievable story. Gretzky got hurt in training camp." As it turned out "The Great One" appeared in only 45 games, the lowest total of his NHL career. The Kings managed a pedestrian record of 39-35-10, finishing third in the Smythe Division. But in the grueling journey known as the NHL playoffs they dumped Calgary and Vancouver in six, before overcoming a three-games-to-two deficit to beat Toronto in seven. Getting three goals and an assist in the finale, Gretzky called it the "greatest game" of his career. The statement seems surprising, coming from the greatest hockey player who ever drew breath. "I'll tell you why he believes that," Melrose says. "I don't know if you realize but Walter [his father] almost died that year. He was really sick. That's why when that game was over and we beat Toronto, he's pointing in the crowd at Walter. He also had the back injury from a hit he had taken. When he played in Edmonton they were supposed to win. We weren't supposed to win in L.A. We never had home ice once in the playoffs. It was one of the rare times that Gretz felt he was an underdog. That's why he felt it was so important." For a moment, it looked as if Los Angeles would win the championship against the Montreal Canadiens. They won game one easily and were ahead 2-1 with under a minute left in game two. "They weren't even getting shots," Melrose remembers. "We were shutting them down." Then Montreal coach Jacques Demers asked officials to measure Marty McSorley's stick. The stick was illegally curved. "The curve makes the puck do tricks," Melrose continues. "It will spin and curve and dip like that (his arm makes a downward motion) at 100 miles per hour. If a dime could fit under your stick that was too much of a curve." McSorley—essentially Gretzky's bodyguard, who had come with him from Edmonton—was shown a seat in the penalty box. The Canadiens also pulled their goalie to get a six on four man advantage. Eric Desjardins tied the game with 1:13 left in regulation and then scored 51 seconds into overtime to give Montreal a 3-2 win. Though they had split the first two games on the road, Los Angeles lost four games to one. "I will remember the stick call for the rest of my life because it influenced the rest of my life," Melrose says, not a trace of lament—or even complaint—in his voice. After the team's unexpected run to the finals, the Kings' upped his contract to $600,000 the following year. For an optimist like Melrose, there were still two things to enjoy. For one, 1993 was the last time Montreal won a cup. People now refer to Montreal's 22-year drought as "The Curse of the Stick." Melrose sneers: "I don't care if they ever win again. I never liked Montreal as a kid since I was a Toronto fan. Obviously 1993 intensified everything. Toronto hasn't won since '67, so right now they have the longest drought of any team." Meanwhile, the Kings have won two cups. He had a second reason to look forward: he had come to Los Angeles to coach Gretzky. What was that like? "I always thought my job in coaching a great player was to make sure that he was on the ice in order to be great. With Gretz I didn't have to worry about matchups that much, because he wanted to play against the other team's best. A lot of times offensive players don't want to play against the other team's best defenseman or best forward. Gretz didn't care. I tried to play him about 25 minutes, which is a lot today. If we needed goals, I had him play more. Some nights he would play 30. It was a different time. You didn't worry about how much a guy played. It's sort of like pitch counts in baseball—no one cared at that time. "He was a great guy. Loved to practice. Loved to be with his teammates. His favorite time was at the rink when he could be unguarded. Loved to joke. People always say, ‘What was he like?' I just said, ‘If I went to Wayne, and said, I want you to try this, I want you to play this guy,' and I would tell him why. If you made sense, Gretz would do it. Just a pleasure to coach. "Here's another thing about him. Everyone thinks he must have had his own room or suite on the road. But his whole career he had a roommate. In L.A. it was Tony Granato. Nowadays, if you play five games in the NHL you get your own room. The greatest player that ever played had a roommate his whole time." All told, the divide between Gretzky and the second greatest is wider than that between first and second in any other major sport. In some sports, like football, you can get a debate about the greatest defender or greatest quarterback. Not in hockey. "The only argument you can make is Gretzky or Orr," Melrose adds. "Who dominated the sport more—Gretzky on offense or Orr on defense?" Perhaps. But that trial balloon won't fly very far. Orr revolutionized defense, but his numbers can't hold a candle to Gretzky's. Was there an unspoken rule among players that no one should hit Gretzky? "People think there was such a rule," Melrose clarifies. "In those days when Gretz played, two things happened. One, he was way better than anyone else. You don't have to be a genius to figure that out. The guy was on a different level. So people say, ‘No one tried to hit him.' But everyone tried—it was just impossible. He was smarter—two steps ahead of everyone else. I remember, something would happen on the ice. The puck would all of a sudden go someplace where it shouldn't go. And Gretz is standing there. And he ended up scoring a goal or getting a breakaway or something. And after the game I'd call him in my office and say, ‘Gretz, look at this.' And I'd show him the play. I wanted to know what made him tick. I said, ‘Gretz, why were you there?' He said, ‘Well, Barry. I just had a feeling. I saw that the puck was going up the ice, I just had a feeling that if I go over here the puck would come to me.' That's what made him great. A second reason was if you hit him in those days, there's a good chance your life was on the line." Gretzky always had a protector. "Two were Dave Semenko (at Edmonton) and Marty McSorley. They knew that Gretz was their bread and butter. They had to protect him. I saw Gretz get hit hard twice. One was in the Canada Cup [in 1991] when Gary Suter hit him into the boards. People think that was the start of his back troubles. The other one was, I'm playing for Toronto, and we're playing in Edmonton. We had this young rookie on the team named Billy McCreary. So Gretz is coming along the blue line this way, and McCreary is coming along this way. They're both looking in different directions. And they run into each other. McCreary was much bigger than Gretz. He hit Gretz hard," Melrose punches his hand with a thwack. "Gretzky had to leave the ice. He came back and played, but it was the hardest hit I ever saw him take. For once, he didn't know where everyone else on the ice was. And as soon as this happened, we got Billy to the bench. That's when [Edmonton's] Dave Semenko skated to our bench and said, ‘Kid, you get off the bench tonight, and I'm going to kill you.' They weren't joking in those days. So the coach kept Billy on the bench the whole game, which was a smart thing to do, because all hell would have broken loose." It's Wednesday night, 11 p.m. back at the studio. Melrose and Levy are talking about trades. They're dressed like fans. Melrose is wearing a blue and red jersey with mustard yellow stripes on the sleeves. Levy has a North Stars shirt—yellow and green with a gargantuan "N" on the chest. Levy asks, "What is the worst trade story?" Barry interrupts: "First off, the greatest trade in the history of sports, I think, is when Tommy Martin, who played for me in the American League (before playing six NHL seasons), got traded for a bus. That is the greatest trade ever. Tommy left Seattle, Seattle got their bus." Sure enough, a visual pops up showing a worker using letters to form the name "Seattle Breakers" on the side of the bus. "From that moment on, Tommy's nickname was ‘Bus Martin.' "
In February, the circle was completed when the Kings honored Melrose for getting them to their first Stanley Cup final, with Cindy by his side on the ice and Levy attending as his guest. It brought back memories for Levy, who in 1995 interviewed Melrose in his L.A. home after he was fired by the Kings. "You just got fired; will you watch the Kings game tonight?" Levy asked. "Nope, I'm taking my wife, Cindy, out to supper." Levy laughs—at the memories of the event of the past, and of Melrose's seemingly endless supply of flashy suits now. "The suits are so custom made that he's moved on to his socks," Levy says. "His socks are out of control. During the finals he'll wear two suits a day: A morning on-air suit and a night on-air suit." There's one other notable feature about life on the road. "The second Barry and I get an assignment together," says Levy, "we are looking for the cigar bars and lounges closest to the arena." Kenneth A. Shouler, a frequent contributor to Cigar Aficionado, is an associate professor of philosophy at the County College of Morris in Randolph, NJ.